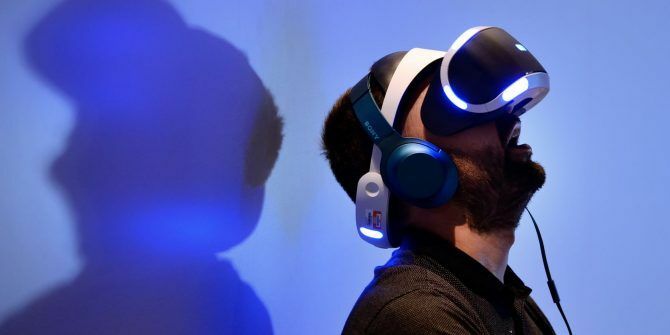 The PlayStation VR headset is the cheapest of the three major headsets on the market now Oculus Rift vs. HTC Vive vs. Playstation VR: Which Should You Buy? Oculus Rift vs. HTC Vive vs. Playstation VR: Which Should You Buy? Virtual reality is right around the corner and there are three systems to choose from. Here's what you need to know to make an informed, smart decision. Read More . It also doesn’t require a high-end PC, which makes it attractive for anyone looking to try VR without spending a fortune. Our review found PlayStation VR Review PlayStation VR Review Sony has finally released their low-cost headset to the world, along with a slew of Playstation games that support the device. Is it worth it? Read More that the platform is a great introduction, even though it can’t compete with the Oculus Rift or HTC Vive. But there’s one extra benefit of the PS VR that’s worth checking out if you own the headset: since the headset uses an external processing box, you can actually plug another system into the processor and view it in your headset. Anything with an HDMI output will work, so you can even try it with your laptop. To do this, you’ll need to connect all the PS VR cables as usual. The difference is that you should connect your other console’s HMDI cable to the HDMI port labeled PS4 on the back of the processor box. Then, connect another HDMI cable in the port labeled TV to your TV as normal. Finally, you must connect the PS VR’s USB cable to the PS4 as normal or this will not work. Because of this, you need your PS4 nearby and turned on to do this. After that, your game will appear on your TV as usual, but also appears inside the VR headset in cinema mode. Obviously this won’t turn games into VR, but it does provide a theater-like experience for games on other systems. It’s a cool way to experience games from another perspective, and you could use it as a second screen if someone else wanted to watch TV. While this isn’t worth buying a PS VR for, it’s a neat little trick emerging from the way the PS VR handles inputs. What will you play in cinema mode first? If you’re getting invested in VR, check out our guide on setting up the perfect VR room How to Set Up the Perfect VR Room How to Set Up the Perfect VR Room If you've got an HTC Vive or Oculus Rift, crafting an awesome VR room will make your virtual reality experience even better. Here are some important tips for setting yours up. Read More . Have you tried using another console on the PS VR? How did it look? Tell us if you find this useful in the comments below! Explore more about: Nintendo Switch, PlayStation VR, Xbox One.